The Calgary Academy tournament champion F.P. Walshe Flyers. Back row: coach Clayton Orr, Cole Black Water, Logan Gregory, Cole Polydore, Jonathan Colp, Nathan Orr and Colton Prete. Front: William Lam and Taylor Atwood. Another season has come quickly for the F.P. 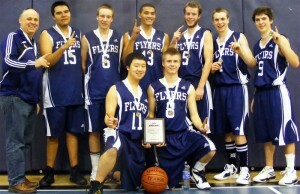 Walshe Flyers senior boys’ basketball team. I’m really excited with the boys we have this year. Mind you I say that every year. I just love the game and love to see the boys play the game they enjoy. We have seven Grade 12 players who want to make their last year the best and a bunch of Grade 11s and 10s who want to tag along for the great ride. The season started with the Flyers travelling to Stirling to play the Lakers. The young, inexperienced JV team suffered an 89-49 defeat. The senior team won 87-81. Leading scorers were Nathan Orr, Logan Gregory and Cole Black Water. We soon realized we had the makings of a good team and could develop into a great team. On Dec 9-10 we went to Taber St. Mary’s tourney where we worked our way to the final game by beating Milk River 71-29 and Coaldale Christian 69-66. 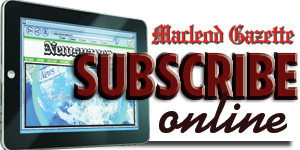 In the final the boys played undisciplined defence in the last three minutes allowing the Stirling Lakers to beat them down the stretch, 69-60. One of our team’s goals this year is to be in the final game of every tournament they go to and to play their best in that game. 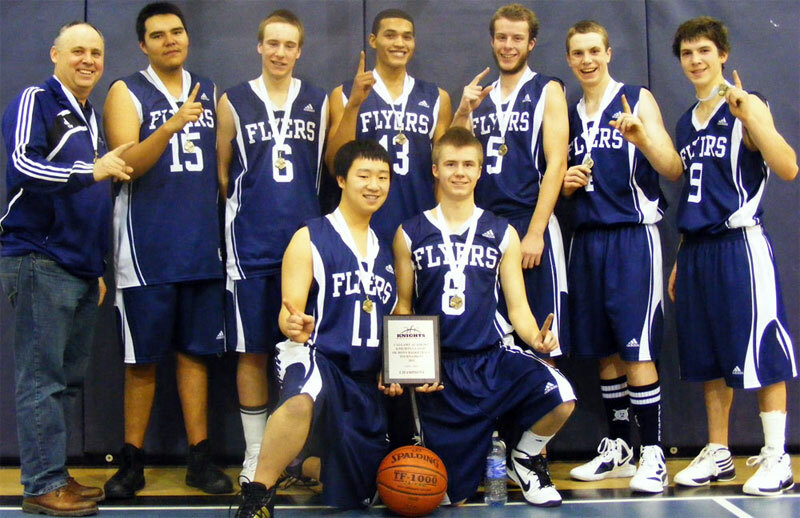 On Dec. 16-17 the Flyers headed to Calgary Academy for a 16-team tournament. We played Webber Academy of Calgary first and won 74-48. Holding the team under 60 saw one of our goals accomplished. Next was Golden, B.C. This game saw tough defence from both teams but in the last 45 seconds Nathan Orr and Logan Gregory made some key baskets. We made some last minute stops to see the Flyers slip by the Golden team 41-40. Saturday morning was the semi-final game against Notre Dame of High River. This game was tight down to the third quarter where the Flyers endurance and conditioning proved to give them the advantage to win the game 41-29. Cole Black Water led the scorers with 19, Logan Gregory had 16 and Nathan Orr had 13. The final game proved to be low scoring from our team. Playing four games in such a short period was a challenge and it showed in the boys’ offence, but their good defence kept the opposition always a little bit in the rearview mirror throughout the game. Banff put in a last minute charge to worry the coach and parents but the time luckily ran out to see the Flyers win the championship 52-49. I know fans always want to have a good team to come and watch. If the community comes out to their games they will see a good team that has a lot of potential this year. Last year the community came out and filled the gym to capacity to watch the Harlem Crowns play. It was great to have the community support. We do not have the Harlem team this year but it would be great to see the gym filled again at every home game. I know if people come out they will go away saying that was great basketball. I can’t promise wins every night but good games and high quality basketball I can. Good home crowd support just might be the difference this year in our tough league.